Thanks to CSN for providing me with a free Hamilton Beach Mixer! I recently did a "teaser" post about a Mixer that I would be reviewing! Well I've received and reviewed it! CSN Stores recently sent me the Hamilton Beach Stand to review and the Verdict : How did I go without a mixer in the past?! This mixer has saved so much time for us when it comes to making meals. The great thing about this mixer is that it's large so you don't need to work as hard to get contents out, and since I have a larger family (of 6) it's great because it mean's we can make bigger things in it. Another wonderful things is that this mixer is large and works great, but it is still very affordable! The Hamilton Beach Mixer is available at CSN Stores for only 47.99 , and the mixer comes with 4 attatchments, 2 for bread, and 2 different traditional mixer heads. Last night me and my grandmother made a dough; we were a little nervous because we have never made dough with a mixer before, but it was really easy, and as simple as pushing a couple of buttons. 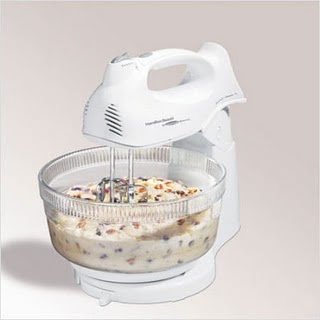 I would personally reccomend this Mixer to anyone; I think it could make a great gift too, and I am honestly thinking of buying one for my aunt for her birthday. Disclosure: This review is entirely my own, it is 100% my own. I received no monetary compensation for my review. Review product was provided to me. Love that it has 4 attatchments, sounds like a great product.